Our own Ken "Oldtime" Bushdiecker, moderator of the CJ-3B Bulletin Board, has put together a detailed history of the changes to "Early Jeep Transfer Cases" -- the Dana-Spicer 18 and 20. Needless to say, there is plenty of stuff here that I didn't know, and Ken tells us not only what Dana did, but why they did it. Jim Allen has compiled a lot of research on an almost-unknown variation of the CJ-5 known as the "Four-6-Two". This was Kaiser Jeep's 1969 V6 "trail-ready" package, in President Red paint. It evolved the following year into the Renegade, which continued successfully for years under AMC's ownership. You'll want to read this. 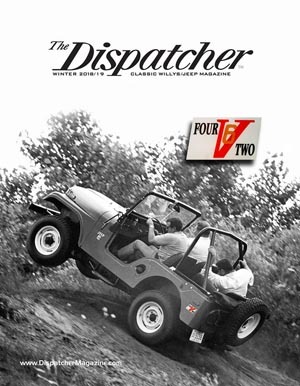 This issue has what we've come to expect: a Reader's Ride profile which also provides the cover photo; one of Jim Allen's great model retrospectives, this time the M-422 Mighty Mite; photo reports from Willys events; and the return of Paul Barry's tech column, discussing shock absorber installation. But who would have expected that the fourth instalment of Bill Norris' story of the Wilson Foundry and its connections with Willys-Overland, would read like a soap opera? Industrial history has seldom been so entertaining. 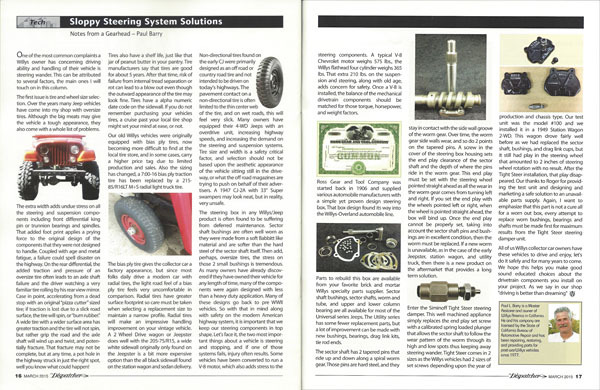 And Part 2 of Barry Thomas' saga "The Making of the Farm Jeep" unearths historical details that every fan of Jeep special equipment will want to read. And meanwhile, a new multi-part feature begins, with Dan Fuccella recounting his restoration of a 1950 Station Wagon, and his plan to take it on a 10,000-mile restaging of a 1920 tour of National Parks in the western U.S. If you have been putting off subscribing, you might also be interested to note that for $100 you can order by mail or online, the entire set of eleven back issues. Subscription prices have gone up for the first time, by $5 a year, a small increase considering the fact that the magazine has almost doubled in size since its debut in 2015. The biggest issue yet, with articles on the SJ Cherokee (from Jim Allen) and Free-Lock locking hubs (from Dave Eilers.) Plus some great Readers' Rides features, Part 2 of the history of the Wilson Foundry (covering the 1920's), and event coverage from the Midstate Jeepster Association, East Coast Willys Association, the Spring Reunion and the Willys Jeep Rally. 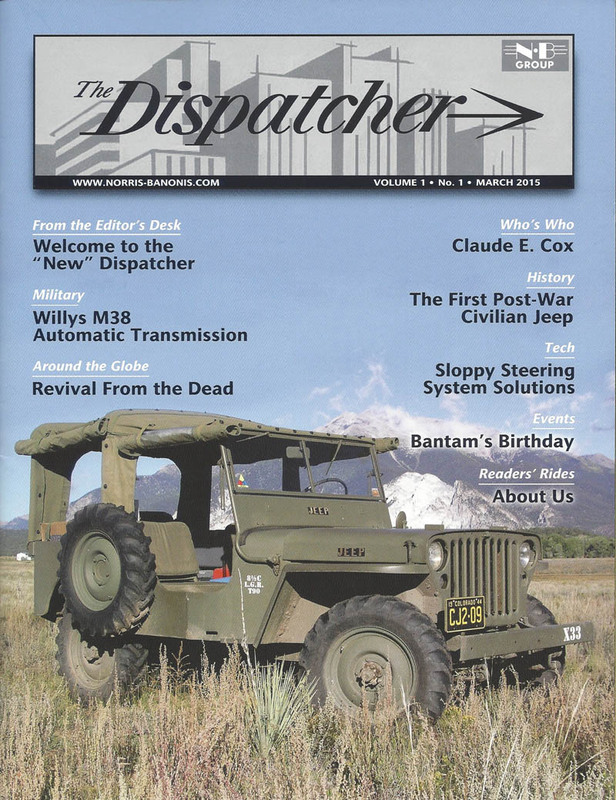 As The Dispatcher starts its third year of publication, the big news is that there is a new website. But don't let that distract from the new issue of the magazine itself, which is possibly the best yet. Lloyd White on postwar rebuilding of jeeps in Germany (left), Jim Allen on the short-lived Honcho pickup, and Bill Norris on the saga of the ill-fated Tornado engine. Also Part 1 of a two-part history of the career of Charles Wilson of the Wilson Foundry, engine builders for Willys-Overland. And there's more, although you won't find a CJ-3B until you get to the classified ads at the back. 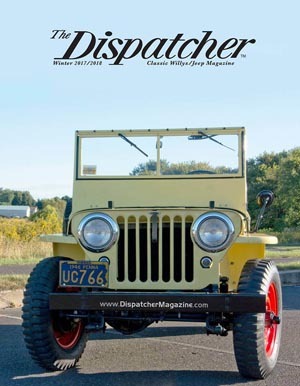 The Dispatcher needs some 3B owners to submit stories on their Jeeps for the "Readers' Rides" section. Oh, wait, I need 3B owners to submit their stories to CJ3B.info! Well, either way would be great. The Readers' Rides features are a highlight of the Winter issue. There are big photos of interesting Jeeps, including the FC-150 tow truck which is on the cover, photographed by Mark Smith at the 2016 Great Willys Picnic, where it made a big splash. 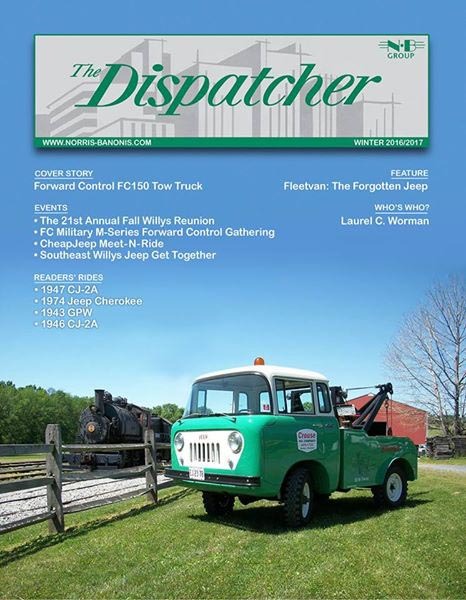 By the way, this issue also has photo reports on four big Willys gatherings from fall 2016. There are a couple of well-researched historical articles full of details I have not seen anywhere else: Dave Eiler's look at Laurel C. Worman and the Worman Jee-Cab hardtops, and Jim Allen's rundown on the "Forgotten Jeep", the FJ-3 Fleetvan. Note: Norris-Banonis has announced that starting in 2017 all subscriptions will simply begin when they are paid for, rather than including all the past issues for that year. Some back issues are available for purchase, but not all. 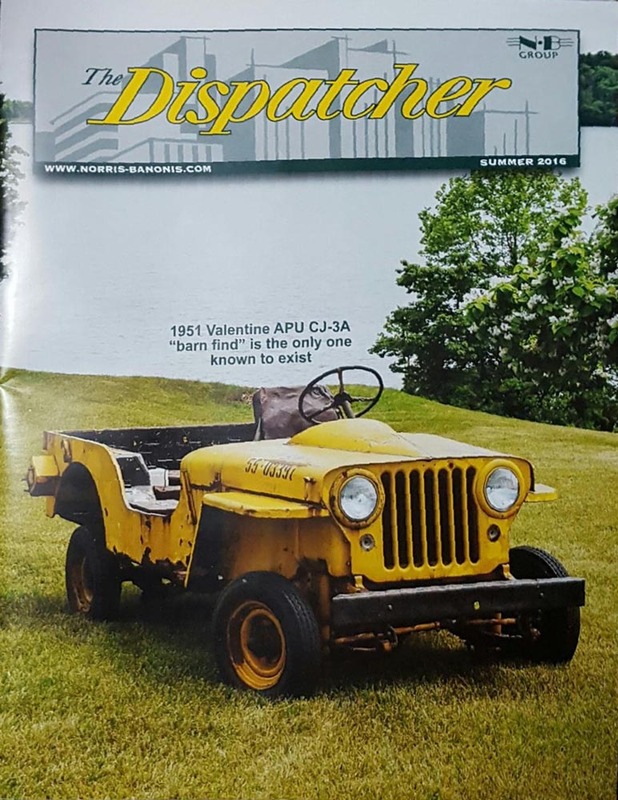 Vol.2 No.3 has several good stories on Readers' Rides, and several in-depth articles on unsusual Jeeps: the full story on the MAHL Jeep Loader, and detailed discussions of two AMC packages (the CJ-5 Super Jeep and the CJ-7 Limited.) 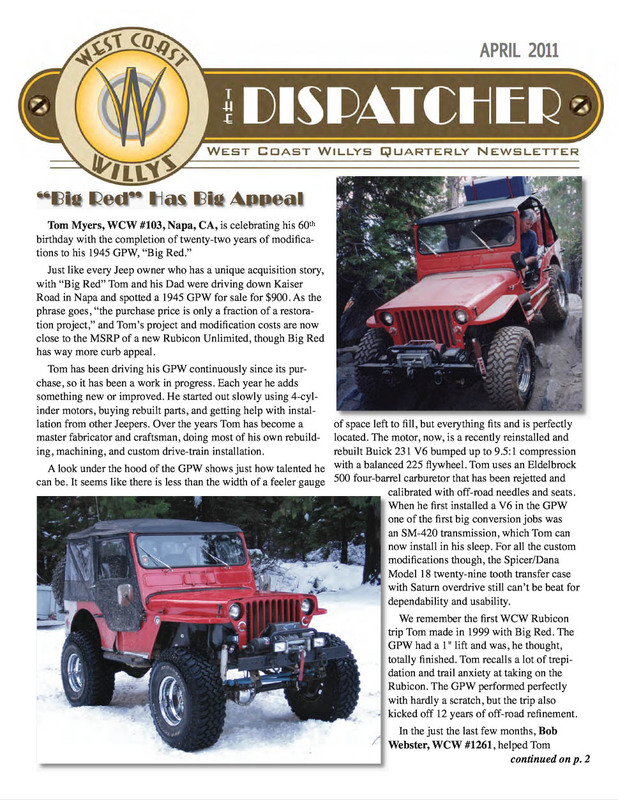 There is a review by Fred Coldwell of Lloyd White's book on the Ford WWII jeeps, and an excerpt about arc welder jeeps from his Willys MB book. There is also a short piece on Walter Appel and his contributions to the VJ Jeepster, and an obituary for the late DJ-3A historian Bruce Agan. The cover photo and centerpiece article in Vol.2 No.2 of The Dispatcher , is very timely for the many people who saw this rare Jeep at Willys shows last spring. Nicholas Oxender has prepared a well researched and illustrated 5-page story about his Navy jet-starting Jeep built by Valentine Welder & Manufacturing. You can see a bit more about this CJ-3A with F-head engine at 8th Annual Willys Jeep Rally on CJ3B.info. Other highlights include John McCabe's piece addressing the question of when exactly is the 75th anniversary of the Jeep, Bob Westerman's look at experimental low-budget versions of the M38, and a tantalizingly brief portrait of designer Brooks Stevens, who had such an interesting career. More subscriptions will help the magazine grow. New subscriptions anytime during 2016 will receive all four issues of Volume 2. The second year of The Dispatcher begins with a smoking issue that says the magazine is here to stay, so you better subscribe or renew your subscription. No CJ-3Bs are featured, but many CJ3B.info readers will be interested in the centerpiece, Jim Allen's 5-page article on Art Gloss' early CJ-2A fire engine. There are also a couple of other CJ-2A Reader's Ride features, and all the details I never knew about the 1971 Hurst Jeepster, in Bill Norris' article "Hurst Goes Commando". Then the story of Walter P. Chrysler's brief but significant contract as General Manager of Willys in 1920-21, a photo piece on an incredibly well-preserved '62 CJ-5, and a book review of Paul Bruno's book about the Bantam Jeep project The First Jeep . 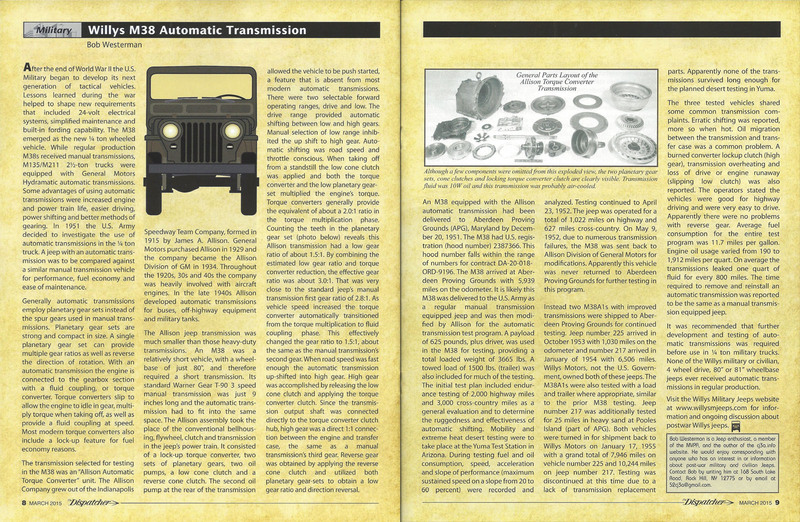 Finally, a capsule history of Postal Jeeps, and Paul Barry's tech tips for putting your Jeep away for the winter and waking it up in the spring. If you like Jeep history, you're going to enjoy this issue. 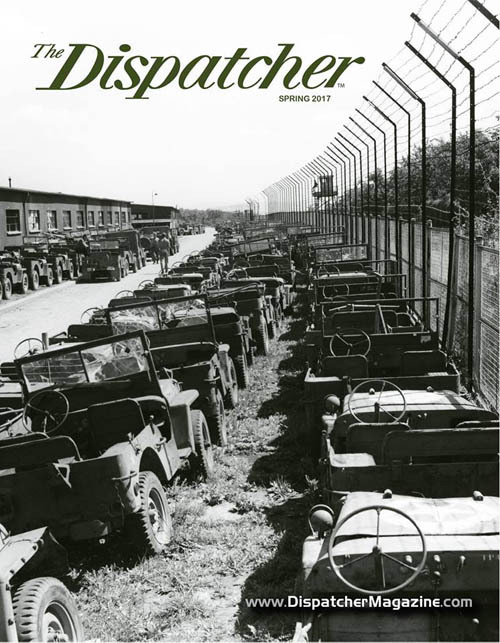 The final issue for the first year (2015) of The Dispatcher continues what is already a tradition of interesting, well-illustrated historical articles based on original research. 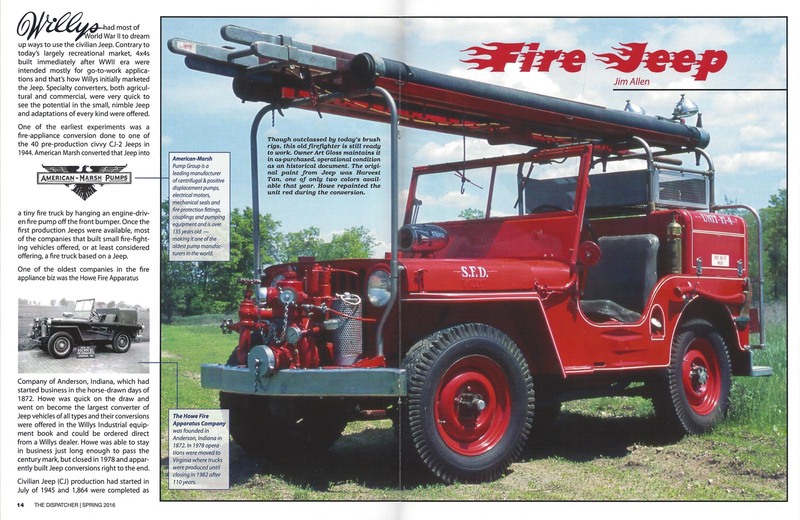 A good introductory article on the DJ-3A Dispatcher is followed by pieces on Jeeps used for automobile club roadside assistance, and the 1941 promotion of the Willys Quad, both of which have lots of photos you have never seen before. The same is true of the story of Blanche Stuart Scott, who drove across the U.S. in an Overland convertible in 1910. Other articles include a tech piece on oil and fuel filters, and Mindy Christy's look behind the scenes of the Northern Ohio Flatfender Gathering (happening again this year on 11 September 2016.) A photo feature on the Colorado Fall Colors Tour is packed with great pictures, but it's too bad that space in The Dispatcher is a bit tight -- a color spread of 14 photos needs more than two pages. Your support will help the magazine grow. New subscriptions anytime during 2016 will receive all four issues of Volume 2. Update: The September 2015 issue had the most pages and the biggest variety of articles yet. As well as several stories about Jeep collectors and events, there is a fascinating piece about attorney George W. Ritter and his role in Willys corporate history (and Empire tractors.) Also a photo story from the trails around Ouray CO by Jeff Petrowich, an introduction to the Borg-Warner overdrive, archival photos of tracked MB's, and a history of the Al-Toy promotional models by Colin Peabody and Glenn Byron. The last time I reviewed a new Jeep magazine and gave it a thumbs-up, it went belly-up soon after, so I'm hesitant to jinx another one. But that was nearly ten years ago, and the publishers were facing a market that was just discovering the internet, and then a huge recession. The prevailing wisdom in 2015 on the other hand, is that there are now real opportunities for niche publications to find readers who want something they can hold in their hands. And as mainstream print media struggle to find advertisers, who are increasingly buying exposure online, small magazines with a very specific audience are able to sell targeted advertising. So this seems like a good time for Norris-Banonis to launch their version of The Dispatcher . They have always said that their Jeep calendars are "nice enough for your coffee table", but the fact is that most of us put the calendars on the wall, so we are in need of something Willys-related for the coffee table or the bathroom. Norris-Banonis is offering a free copy of their first issue (left) if you send them an e-mail -- contact information is below. 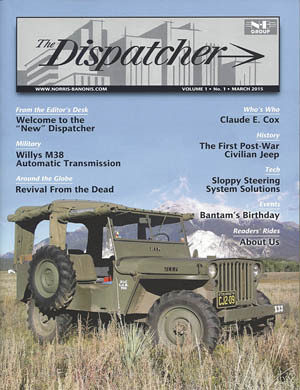 The Dispatcher was around for many years as a top-quality club newsletter (right) published quarterly by West Coast Willys. But the organization was loooking for someone to take it over, and Norris-Banonis saw it as a logical step from their calendar business. They decided to make the magazine a little larger and glossier, and undertake to market it more aggressively. They are sticking with the quarterly publication schedule, and also retaining the policy of free classified ads for subscribers. The plan is for the magazine to feature well-researched historical and technical articles, and in fact there is a real value in putting this kind of material on paper. We're used to consulting websites for information, but websites are actually ephemeral and require constant support -- they can disappear overnight. The first issue of the new The Dispatcher includes an article by Paul Barry of Willys America, on maintaining Willys steering systems (left). 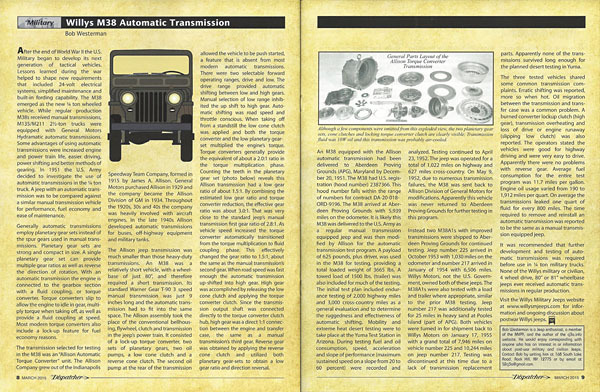 Another article is an excellent piece of historical research by Bob Westerman, describing the testing by the U.S. Army of M38 and M38A1 Jeeps with automatic transmissions (left). There's also an article by Fred Coldwell on the CJ-1 and CJ-2, and a Readers' Rides section. And a biography of Claude Cox, founder of Overland Automotive, which is an example of Norris-Banonis' intention to include Willys-Overland history from the pre-Jeep era. 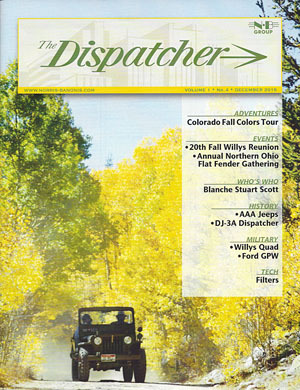 For subscription information, see The Dispatcher website. You can also e-mail them to request a free issue -- put "sample copy request" in the subject line. See also Norris-Banonis' Holy Toledo! Jeep Calendar on CJ3B.info.